The case is that of a patient who was complaining of breathlessness. Her tests revealed certain changes in the ECG while other tests were normal. After consulting certain doctors she visited GMCH, Patiala and was attended by Dr.Srinivasan Reddy, Professor of Cardiology, who advised her angiography. Angiography was performed on her on 14/07/2016 which revealed that there is stenosis (blockade) in three vessels to the extent of 70%, 80% and 95%. The patient’s family gave consent for the stenting, however after about 15 to 20 minutes into the procedure , the complainant was called inside the operation theatre by Dr.Reddy and he was told that his wife is serious as there is water in her lungs and the tube had been inserted. CPR was being performed on her. the complainant alleged that he requested Dr.Reddy to refer to the patient to PGI or any other hospital, in case, they are unable to handle the case but Dr.Reddy said that there is no use, at this stage, as his wife expired on table during procedure, whereas, on the paper, she was declared dead at 4.30 PM. RTI for angiography revealed mid left anterior descending (LAD) artery was having 80% stenosis with myocardiac bridge and angulation, whereas, the distal LAD was normal, while left circumflex (LCX)-OM-1 was having 95% stenosis while distal LCX had 70% stenosis. Before the court, the complainant alleged that he requested Dr.Reddy to go for byepass surgery when the said doctor told that bye pass surgery is a thing of the past and lot of innovations have come in the treatment of blocked arteries under the medical sciences recommending stenting. The next allegation of the patient was concerning the process of opening the arteries. As per angiography, there was thrombotic occlusion of OM-1. It was alleged that OM-1 which was one of the major artery was having 95% blockade and had thrombotic occlusion and in this regard, only course of action advisable for any cardiologist was to first secure the culprit vessel i.e. OM-1 but to the contrary,the doctor first opened LAD, which only had 80% stenosis and because of the complication in that procedure, the blood supply to the heart and vital organ stopped and the patient died. It was further alleged that if OM-1 had been opened first, as the partial blood supply would have continued from LAD and after securing OM-1 the doctor should have opened LAD and even there was some complication, the patient would have got the blood supply from the secured OM-1 and would have survived the procedure. It was further stated that the procedure adopted by Opposite Party No.2 (the cardiologist) was not the correct procedure, as per the medical books. The doctor had performed stenting procedure to the best of his skills and medical acumen. Opposite Party No.2 had shown coronary artery blockages to the attendants of the deceased (including the complainant) on the screen/monitor in the catheterization laboratory, besides in diagram format. 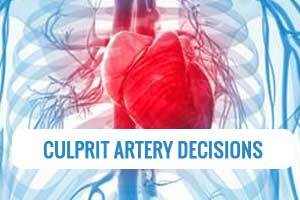 The complainant and his son were well informed about the complications involved in the stenting procedure, the risk involved during the procedure, long term benefits and adverse effects in detail to them and after understanding the same, the complainant had given his written consent. The patient .. (since deceased) was given full medical care, all medical support and was treated by Opposite Party No.2 with the best of his ability. In Column No.16 of the Death Report/Death Certificate shows summary of cause of death, which was “CAD, Triple Vessel Disease, unstable angina, post angioplasty, cardiogenic shock, pulmonary edema.” Further, it was observed that by Opposite Party No.2 that the procedure of stenting (angioplasty) was done in all the arteries and there was a complication of pulmonary edema (fluid in lungs), due to which, the condition of the patient deteriorated. The complainant in this case averred that OM 1 had 95% blockade with thrombotic occlusion. The diagnostic coronary angiogram never reports or mention any thrombus anywhere in any of the arteries. The coronary angiogram contains the report of stenosis (blockages) and intended plan of the procedure. The coronary angioplasty report contained details of the entire procedure after the initial coronary angiogram. During the procedure there are multiple events, which occurred and everything described in detail. The patient was a case of unstable angina. The diagnosis of culprit lesion in unstable angina with multiple stenosis (blockages) is not easy without any significant ECG changes. The unfortunate complication, which occurred in LAD has nothing to do with the blood supply getting from the other artery. This complication is due to inherent nature of the vessel wall. The artery OM cannot be tackled signgularly as it is a branch of LCX and has to be operated simultaneously with its main vessel as a bifurcation lesion. The complainant in this case averred that after opening LAD, the blood supply to the heart had stopped, which is false. All the arteries were opened i.e. LAD, LCX and its branch (OM). The location of the culprit lesion is ambiguous in this case in view of the ECG Report (absence of ST elevation) and significant (>70% stenosis) disease in all the arteries on diagnostic coronary angiogram. To summarise, in this present case, the decision is left to the operator at his discretion whichever is best suitable to the condition to operate in a safer way, the court stated. There is bifurcation lesion in LCX and OM. In the LAD there is a very focal localized lesion. Opening of OM artery alone is not possible as a single vessel, as the stent proximal edge, if operated first will come into the way of LCX and the blood flow will get obstructed. Then the delivery of stent into this LCX will be difficult. The support of LAD is required to open all the blocked arteries. The averment of the complainant that OM was a culprit vessel and had to be opened first does not hold true. Opposite Party No.2 had full freedom to exercise on the operation table as to what procedure is beneficial to the patient. Opposite Party No.2 put into practice the best possible medical remedy available to him in doing the angioplasty. He was the best judge of the situation. Going by the principles of medical negligence, as brought in the Hon’ble Apex Court judgment, referred to above, we find that there is no case of medical negligence and the complaint deserves to be dismissed. Do we have patanjli stents and angioplasty and cabg. I think we need them. Because ayurveda is godly and no errors and side effects. And above all the expert commentators with least medical knowledge abusing doctors should follow ayurveda and will never die. Getting the documents / consent signed by patient family prior to surgery is being badly abused by medical team. Prior to surgery doctor and his team would be like 200% confident that they are expert surgeons , once patient gets admitted for surgery then doctor realises oh no he is human so risk should also be considered and he cannot be 200% sure. Patient family is highly confused between 200% vs risk factor. Finally during the surgery the true expertise of doctor and his team is revealed. Patient dies but no harm to doctor he is secured by those tens of document signed and additionally he gets good money . Similar incident happened with us, doctor Vijay Dikshit so called renowned surgeon of india happily operated patient for heart valve replacement at Apollo Jubilee Hills Hyderabad. Patient family spent 1 month is understanding the case that time Apollo hyderabad cardiology doctors advised as if they are experts in heart valve surgeries . Just 3 days after surgery patient developed lung infection(as informed by hospital , truth no one knows) . June 15 2018 patient passed away at Apollo Jubilee Hills. To top this up Dr Dixit had planned holiday 3 days after surgery so he was no where available while patient was battling for life. Shame on these idiots , the only way they will feel the pain is when their children or spouse or parents develop these criticalities and they are helpless to save them. I don\’t know why in these cases court is not appointing expert committee. Judge is not a medical person. Understanding complex treatment and interpreting medical literature is non a job to be done by non professional. Only other expert in respective fields should do that. Medical person makes decision based on skills, knowledge, current practice, local resources available, risk Vs benefits in that situation. It\’s not mathematics. It\’s difficult to come to conclusion about appropriateness of treatment unless it is significant departure from accepted practice. Kindly don’t give wrong information that Cabg is the only option for multivessel disease . There are several factors which are there which helps in deciding on Cabg or PCI like the syntax score . Only patient with high syntax scores benefit from Cabg . FFR is another option of deciding which lesion needs intervention and which can be managed medically. Ivus and OCT are good tools, there is no second thought on that, but even in Usa and Europe it is not used for every patient, it is highly recommended for those patients having left main disease or complex lesion subsets. Mutivessel pci is an option for patient if really indicated or for those who are unfit for Cabg . The doctor has done Pci after consent. He has put a temporary pacemaker plus Iabp support, what has to be done, he has done . It seems some other doctor has instigated the family to complain. Sorry if hurt anyone’s intention. The doctor says he could not ascertain the culprit artery on basis of angiography. Fine, but he could have used ivus or Oct to find out artery with thrombus. Many centres are using ivus and oct. That\’s not an excuse. Most like the culprit artery was om1 and in negotiating lad, lad got blocked and massive heart attack occurred and subsequent death. He should have straight away referred the patient for cabg as it was already triple vessel disease.